The Nimbarka Sampradaya (IAST: Nimbārka Sampradāya, Sanskrit निम्बार्क सम्प्रदाय), also known as the Hamsa Sampradāya, Kumāra Sampradāya, Catuḥ Sana Sampradāya and Sanakādi Sampradāya, is one of the four Vaiṣṇava Sampradāyas. It was founded by Nimbarka (c.7th century CE), and teaches the Vaishnava theology of Dvaitadvaita (dvaita-advaita) or "dualistic non-dualism." Dvaitadvaita states that humans are both different and non-different from Isvara, God or Supreme Being, and is also known as Bhedābheda (bheda-abheda) philosophy. 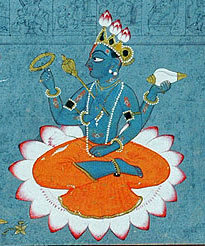 Śrī Haṃsa Bhagavān, the originator of the Śrī Nimbārka Sampradāya. Sri Sanaka, Sanandana, Sanatana and Sanat Kumara - the four Kumaras. According to tradition, the Nimbarka Sampradaya Dvait-advait philosophy was revealed by Śrī Hansa Bhagavān to Sri Sankadi bhagwan, one of the Four Kumaras; who passed it to Sri Narada Muni; and then on to Nimbarka. The Four Kumaras, Sanaka, Sanandana, Sanātana, and Sanat Kumāra, are traditionally regarded as the four mind-born sons of Lord Brahmā. They were created by Brahmā in order to advance creation, but chose to undertake lifelong vows of celibacy (brahmacarya), becoming renowned yogis, who requested from Brahma the boon of remaining perpetually five years old. [web 1] Śrī Sanat Kumāra Samhitā, a treatise on the worship of Śrī Rādhā Kṛṣṇa, is attributed to the brothers, just like the Śrī Sanat Kumāra Tantra, which is part of the Pancarātra literature. In the creation-myth of this universe as narrated by the Paurāṇika literature, Śrī Nārada Muni is the younger brother of the Four Kumāras, who took initiation from his older brothers. Their discussions as guru and disciple are recorded in the Upaniṣads with a famous conversation in the Chāndogya Upaniṣad, and in the Śrī Nārada Purāṇa and the Pañcarātra literature. 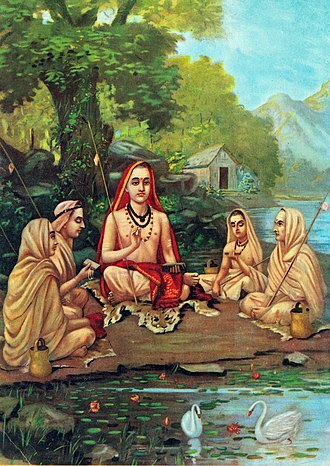 Nārada Muni is recorded as main teacher in all four of the Vaiṣṇava Sampradāyas. According to tradition, he initiated Śrī Nimbārkācārya into the sacred 18-syllabled Śrī Gopāla Mantra, and introduced him to the philosophy of the Yugala upāsana, the devotional worship of the divine couple Śrī Rādhā Kṛṣṇa. 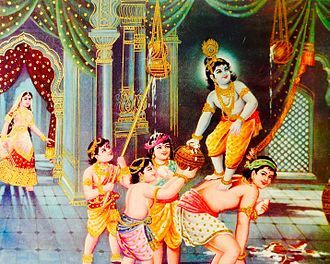 According to tradition, this was the first time that Śrī Rādhā Kṛṣṇa were worshipped together by anyone on earth other than the Gopis of Vṛndāvana. Śrī Nārada Muni then taught Nimbarka the essence of devotional service in the Śrī Nārada Bhakti Sūtras. Śrī Nimbārkācārya already knew the Vedas, Upaniṣads and the rest of the scriptures, but perfection was found in the teachings of Śrī Nārada Muni. According to the Bhavishya Purana, and his eponymous tradition, the Nimbārka Sampradāya, Śrī Nimbārkāchārya appeared in the year 3096 BCE, when the grandson of Arjuna was on the throne. Nimbarka is conventionally dated at the 12th or 13th century, but this dating has been questioned, suggesting that Nimbarka lived somewhat earlier than Shankara, in the 6th or 7th century CE. According to Roma Bose, Nimbarka lived in the 13th century, on the presupposition that Śrī Nimbārkāchārya was the author of the work Madhvamukhamardana. [note 1] Bhandarkar has placed him after Ramanuja, suggesting 1162 AD as the date of his demise. 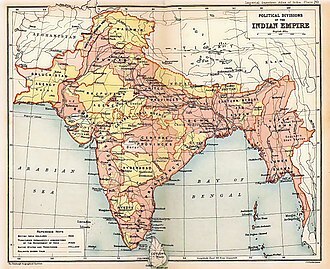 S.N.Dasgupta dated Nimbarka to around middle of 14th century, while S. A. A. Rizvi assigns a date of c.1130–1200 AD. According to Satyanand, Bose's dating of the 13th century is an erroneous attribution, Malkovsky notes that in Bhandarkar's own work it is clearly stated that his dating of Nimbarka was an approximation based on an extremely flimsy calculation; yet most scholars chose to honour his suggested date, even until modern times. According to Malkovsky, the latest scholarship has demonstrated with a high degree of clarity that Nimbarka and his immediate disciple Shrinivasa flourished well before Ramanuja (1017–1137 CE), arguing that Shrinivasa was a contemporary, or just after Sankaracarya (early 8th century). According to Ramnarace, summarising the available research, Nimbarka must be dated in the 7th century CE. 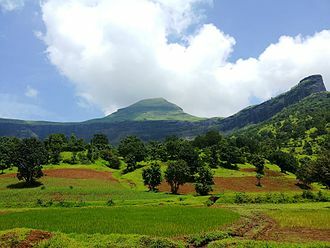 According to tradition, Nimbārka was born in Vaidūryapattanam, the present-day Mungi Village, Paithan in East Maharashtra. His parents were Aruṇa Ṛṣi and Jayantī Devī. Together, they migrated to Mathurā and settled at what is now known as Nimbagrāma (Neemgaon), situated between Barsānā and Govardhan. The Nimbarka Sampradaya is based on Nimbarka's Dvait-advait philosophy, duality and nonduality at the same time, or dualistic non-dualism. According to Nimbarka, there are three categories of existence, namely Isvara (God, Divine Being); cit (jiva, the indivual soul); and acit (lifeless matter). Cit and acit are different from Isvara, in the sense that they have attributes (Guna) and capacities (Swabhaava), which are different from those of Isvara. At the same time, cit and acit are not different from Isvara, because they cannot exist independently of Him. Isvara is independent and exists by Himself, while cit and acit exist in dependence upon Him. Difference means a kind of existence which is separate but dependent, (para-tantra-satta-bhava); while non-difference means impossibility of separate existence (svatantra-satta-bhava). According to Nimbarka, the relation between Brahman, on the one hand, and the souls (cit) and universe (acit) on the other, is a relation of natural difference-non-difference (svabhavika-bhedabheda). [note 2] Nimbarka equally emphasises both difference and non-difference, as against Ramanuja, who makes difference subordinate to non-difference, in as much as, for him cit and acit do not exist separately from Brahman, but are its body or attributes. Nimbarka accepts parinamavada, the idea that the world is a real transformation (parinama) of Brahman, to explain the cause of animate and inanimate world, which he says exist in a subtle form in the various capacities (saktis), which belong to Brahman in its natural condition. Brahman is the material cause of the universe, in the sense that Brahman brings the subtle rudiments into the gross form, by manifesting these capacities. For Nimbarka the highest object of worship is Krishna and His consort Radha, attended by thousands of gopi's, or cowherdesses, of the celestial Vrindavan. Devotion, according to Nimbarka, consists in prapatti, or self-surrender. The Highest Reality, according to Nimbarka, is Brahman, Krishna or Hari, a personal God. There is nothing that is equal to Him, nothing that is superior. He is the Lord of all, and Controller of all. He is called Brahman because of the unsurpassed greatness of His nature and qualities, because He is beyond any limit of any kind of space, time or thing. Brahman is the sole cause of creation, maintenance and destruction of the Universe. All beings arise from Him, nothing is superior to Him. The Lord alone is the first cause, the manifestor of all names and forms, and none else. This Brahman is both the upadana (material cause) and the Nimitta (efficient cause). It is the material cause in the sense that it enables its natural saktis, viz. the cit and the acit in their subtle forms, to be manifested in gross forms; and it is the efficient cause in the sense that it unites the individual souls with their respective fruits of actions and means of enjoyments. Nimbarka discusses two aspects of Brahman. On one hand, Brahman is eternal and great, the greatest of the great, the highest of the high, the creator, etc. of the Universe, high above the individual soul, of which He is the Lord and the ruler. But, on the other aspect He is the abode of infinite beauty, bliss and tenderness, and in intimate connection with the soul. He is the abode of supreme peace, supreme grace, and the ocean of all sweetness and charms. Thus, Brahman possessed of attributes and adorable by all, has four forms or vyuhas (i.e., Vasudeva, Sankarsana, Pradyumna, and Aniruddha) and appears under various incarnation as Matsya, Kurma etc. The cit or individual soul is of the nature of knowledge (jnana-svarupa); it is able to know without the help of the sense-organs and it is in this sense that words like prajnana-ghanah svayamjyotih jnanamayah etc. as applied to jiva are to be understood. The jiva is the knower also; and he can be both knowledge and the possessor of knowledge at the same time, just as the sun is both light and the source of light. Thus the soul, who is knowledge, and his attribute, knowledge, though they are both identical as knowledge, can be at the same time different and related as the qualified (dharmin) and the quality (dharma), just as the sun and his light, though identical as light (taijasa), are still different from each other. Thus there is both a difference and a non-difference between the dharmin and dharma; and the extreme similarity between them implies, not necessarily their absolute identity, but only a non-perception of their difference. The jiva is also ego (ahamarthah). This ego continues to persist not only in the state of deep sleep, (because our consciousness immediately after getting up from sleep has the form slept happily or knew nothing) but also in the state of liberation. It even belongs to the Parabrahman. Hence it is that Krishna refers to Himself so frequently in the first person in the Gita, of which the chief object is thus Purusottama, who is omniscient and at the same time non-different from the ego or asmadartha. The jiva is also essentially active (kartr). This quality belongs to it in all its conditions, even after release. But the kartrtva is not independent. The jiva is also enjoyer (bhoktr) essentially in all its conditions. For his knowledge and activity, however, the jiva depends on Hari; thus, though resembling Him in being intelligent and knower, he is at the same time distinguished from him by his dependence. This quality of dependence or of being controlled (niyamyatva) is the very nature of jiva even in the state of release, just as niyamyatva or the quality of being the controller, forms the eternal nature of Isvara. The jiva is atomic in size; at the same time his attribute, knowledge, is omnipresent, which makes it possible that he can experience pleasure and pain in any part of the body, just as, for instance, the light of a lamp can spread far and wide and illumine objects away from the lamp. The Jivas are different and in different bodies, and so are infinite in number. The acit is of three different kinds: viz. 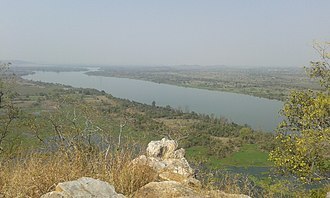 prakrta, aprakrta, and kala. Prakrta, or what is derived from Prakrti, the primal matter, aprakrta is defined negatively as that which is not the product of prakrti, but its real nature is not clearly brought out. These three categories in their subtle forms are as eternal as the cit or the individual souls. Prakrti, or the primal matter-the stuff of the entire universe is real and eternal like the individual souls, and like them, though eternal and unborn, has yet Brahman for its cause. It consists of the three qualities of sattva, rajas and tamas, such as prakrit, mahat, ahankara etc. (just similar to 24 principles of the Sankhyas). The jiva has his true form distorted and obscured owing to his contact with karma resulting from ignorance, which is beginningless, but which can come to an end, by the grace of God, when its true nature is fully manifested. Ignorance is a part of God and is the basis of cosmic manifestation i.e. the arising of God with attributes. a sense of helplessness (karpanya). the nature of the obstacles in the way of the attainment of God, such as regarding the body and the mind as the soul, depending on someone who is neither God nor the preceptor, neglecting their commands, and considering God as nothing more than an ordinary being. The basic practice consists of the worship of Sri Radha Madhav, with Sri Radha being personified as the inseparable part of Sri Krishna. Nimbarka refers to five methods to salvation, namely karma (ritual action); vidya (knowledge); upasana or dhyana (meditation); prapatti (surrender to the Lord/devotion); Gurupasatti (devotion and self-surrender to God as Shri Radha Krsna). Performed conscientiously in a proper spirit, with one’s varna (caste) and asrama (phase of life) thereby giving rise to knowledge which is a means to salvation). Not as a subordinate factor of karma but also not as an independent means for everyone; only for those inclined to spending vast lengths of time in scriptural study and reflection on deeper meanings. It is of three types. First is meditation on the Lord as one's self, i.e. meditation on the Lord as the Inner Controller of the sentient. Second is meditation on the Lord as the Inner Controller of the non-sentient. Final one is meditation on Lord Himself, as different from the sentient and non-sentient. This is again not an independent means to Salvation for all, as only those qualified to perform the upasana (with Yajnopavitam) can perform this Sadhana. Devotion and self-surrender to God as Shri Radha Krsna. This method of attaining Salvation, known as Prapatti Sadhana, contains elements of all the other means, and is most importantly, available to all. Men, women, foreigners, all classes and castes (or non-castes) are permitted to seek liberation through this, the most important Sadhana. It is referred to as Sadhana (or Apara) Bhakti – devotion through regulations. This in turn leads to Para Bhakti – the highest devotion characterised by Madhurya Rasa – the sweet emotions of devotion experienced by those perfected in Sadhana Bhakti. Devotion and self-surrender to guru. Best realised as a part in Prapatti, and not as an independent means, although it can be so. 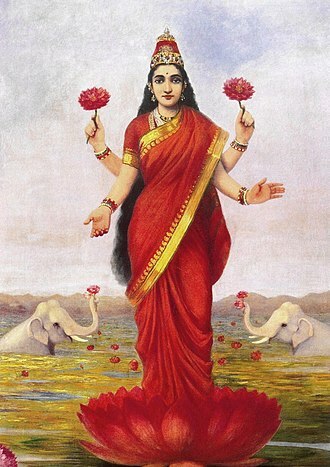 Sri Nimbarka made the "Bhasya" (commentary in which alle the words of the verses are used, in contradistinction to a tika, which is a more free commentary) of the Brahmasutra on his Dvaitadvaita Vedanta (Principle of Dualism-Nondualism) in his famous book "Vedanta Parijata Sourabha". "To the left hand side of Goloka Bihari is the daughter of King Vrishabhanu, Sri Radha, who is as beautiful as the Lord and is worshipped by thousands of handmaidens. She fulfills the wishes of all. Sri Kishori is eternally remembered as Sri Ji." Svāmī Harivyāsa Devacārya (c.1470-1540 CE), the 35th leader, reformed the tradition. He was given the śālagrāma deity known as Śrī Sarveśvara that was handed down through time it is believed from Nimbārka himself. He anointed twelve of his senior disciples to lead missions throughout the land. The most famous are Svāmī Paraśurāma Devācārya (c.1525-1610 CE) and Svāmī Svabhūrāma Devācārya (fl. 16th century). Svāmī Svabhūrāma Devācārya (fl.16th century CE) was born in Budhiya Village, outside Jagadhri and Yamunanagar near Kurukshetra in modern Haryana, India. He established over 52 temples in Punjab, Haryana and Vraja during his lifetime; his current followers are found mostly in Vṛndāvana, Haryana, Punjab, Bengal, Rajasthan, Orissa, Assam, Sikkim, Bihar, other regions in Uttar Pradesh and Maharashtra, also in significant numbers in Nepal. Saint Swami Chatur Chintamani Nagaji Maharaj, who started the Vraja Parikrama. This tradition has been continuously maintained over 528 years by the Acharyas of the Svabhurāma-Dwara (sub-lineage). Swami Sri Ramdas Kathiababa came to Vrindavan and made his first monastery there. He was succeeded by Swami Santadas Kathiababa and Swami Dhananjaya Das Kathia Babaji Maharaj. Swami Dhananjaya Das Kathia Babaji built several ashrams. This branch is currently led by Swami Ras Bihari Das Kathia Baba at Sri Kathia Baba Ka Sthan, Sridham Vrindavan, India. 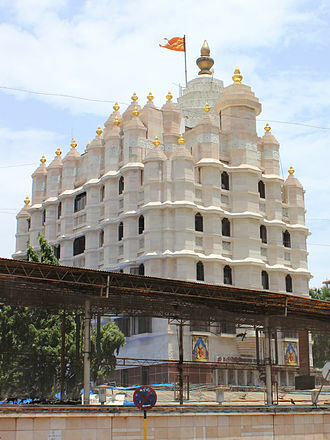 This ashram is known as the Gurugadi, or seat of the Guru, of this sub-branch. The present Acharya Swami Ras Bihari Dasji Kathia Baba has constructed 20 new temples and monasteries in India and abroad. Swami Brindaban Bihari Das Mahanta Maharaj at Kathia Baba ka Ashram, Shivala, Varanasi, Uttar Pradesh and Sukhchar, 24-Parganas (North), West Bengal, who has undertaken projects for orphans and aged persons, building schools and elderly care homes. He travels relentlessly to spread Nimbarka Philosophy through world religion conferences held in US, UK, Sweden, Africa, Bangladesh and other different countries across the globe. The Sukhchar Kathiababar Ashram was originally established by Swami Dhananjaydas Kathiababa and is presently headed by Swami Brindabanbiharidas Mahanta Maharaj. The famous teacher and leader Svāmī Haripriyā Śaraṇa Devācārya, founded the temple and monastery at Bihari Ji Ka Bageecha, Vṛndāvana, sponsored by his disciple, the philanthropic Shri Hargulal Beriwala and the Beriwala Trust in the 19th century. The predecessor of the current successor was Svāmī Lalitā Śaraṇa Devācārya, who died in July 2005 at the age of 103. One of his other disciples is the world-renowned Svāmī Gopāla Śaraṇa Devācārya, who has founded the Monastery and temple known as the Shri Golok Dham Ashram in New Delhi and Vṛndāvana. He has also helped ordinary Hindus who are not Vaiṣṇava to establish temples overseas. Of note are the Glasgow Hindu Mandir, Scotland, UK: the Lakshmi Narayan Hindu Mandir, Bradford, UK; and the Valley Hindu Temple, Northridge, CA. He has also facilitated major festivals at the Hindu Sabha Mandir in Brampton, Canada. The 48th leader of the Nimbārka Sampradāya is H.D.H. Jagadguru Nimbārkācārya Svāmī Śrī Rādhā Śarveshavara Śaraṇa Devācārya, known in reverence as Śrī Śrījī Māhārāja by his followers. His followers are mainly in Rajasthan and Vṛndāvana, Mathura. He established the Mandir at the birth site of Śrī Nimbārkācārya in Mungi Village, Paithan, Maharashtra in 2005. In addition, he oversees the maintenance of thousands of temples, hundreds of monasteries, schools, hospitals, orphanages, cow-shelters, environmental projects, memorial shrines, etc., and arranges various scholarly conventions, religious conferences, medical camps & outreach, etc. The 49th and current leader of the entire Nimbārka Sampradāya is H.D.H. Jagadguru Nimbārkācārya Svāmī Śrī Shyām Śaraṇa Devācārya, known in reverence as Śrī Śrījī Māhārāja by his followers. He is based in Nimbārka Tīrtha Rajasthan, India. He is the current leader of the Sampradāya, who worships the śālagrāma deity known as Śrī Sarveśvara. His followers are mainly in Rajasthan and Vṛndāvana, Mathura. ^ Bose: "There is a manuscript called " Madhva -mukha-mardana", a criticism of Madhva's religion, attributed to Nimbarka. This places Nimbarka after Madhva, provided the work is really by Nimbarka. The fact that the manuscript is not lent to anybody by the followers of Madhva, perhaps prevented us as well from having it, no reply even being given to our enquiries. It seems Nimbarka undertook the work because it was Madhva's immediate influence jupon the people which he had to fight against for making his own campaign successful. Thus, from internal evidences from well-known works by Nimbarka, we can definitely assert that Nimbarka oould not have flourished before Samkara, whereas we are led to think, on the evidence of the manusoript mentioned above, that he did not flourish also before Madhva; i.e. not before the 13th century A.D.
^ Just like between snake and coil, or between sun and its rays. Just as the coil is nothing but the snake, yet different from it; just as the different kinds of stones, though nothing but earth, are yet different from it; so the souls and the universe, though nothing but Brahman (brahmatmaka), are different from Him because of their own peculiar natures and attributes. ^ Nārada-bhakti-sūtra: The secrets of transcendental love. Bhaktivednta Book Trust Publictions. 1991. p. 7. ISBN 9789383095124. ^ a b Bose 1940. ^ Ramnarace 2014, p. 180. ^ Jones, Constance (2007). Encyclopedia of Hinduism. New York: Infobase Publishing. p. 312. ISBN 0-8160-5458-4. ^ Literature, Nimbark. "Nimbark Philosophy". shri jagat guru nimbarkacharya peeth. AKHIL BHARATIYA NIMBARKACHARYA PEETH SALEMABAD, RAJASTHAN. Retrieved 1 January 2009. ^ "Bhaktivedanta VedaBase: Srimad Bhagavatam 3.12". Vedabase.net. Archived from the original on 2 March 2013. Retrieved 22 December 2012. Matsya is the avatar of the Hindu god Vishnu in the form of a fish. Often listed as the first avatar in the lists of the ten avatars of Vishnu, Matsya is described to have rescued the first man, Manu. Matsya may be depicted as a giant fish, or anthropomorphically with a human torso connected to the half of a fish. The earliest accounts of the legend associate Matsya with the creator god Prajapati, Puranic scriptures incorporate Matsya as an avatar of Vishnu. When the flood destroys the world, Manu - in some versions accompanied by the seven great sages - survives by boarding the ark, which Matsya pulls to safety. In versions of this story, the sacred texts Vedas are hidden by a demon, whom Matsya slays, Manu is rescued, the tale is in the tradition of the family of flood myths, common across cultures. 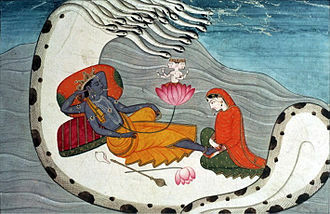 Matsya is depicted in two forms, as a fish or in an anthropomorphic form. He holds in two of his hands the Sudarshana chakra and a shankha, the weapons of Vishnu. The other two make the gestures of varadamudra, which grants boons to the devotee, and abhayamudra. In another configuration, he might have all four attributes of Vishnu, namely the Sudarshana chakra, a shankha, a gada, the human torso generally wears a shawl and a garland. The shawl, worn over his elbows, may be wrapped such that the switch between the human torso and fish half is hidden, Matsya may be depicted alone or in a scene depicting his combat with a demon. A demon called Shankhasura emerging from a conch is sometimes depicted attacking Matsya with a sword as Matsya combats or kills him. Both of them may be depicted in the ocean, while the god Brahma and/or manuscripts or four men, in some scenes, Matsya is depicted as a fish pulling the boat with Manu and the seven great sages on it. 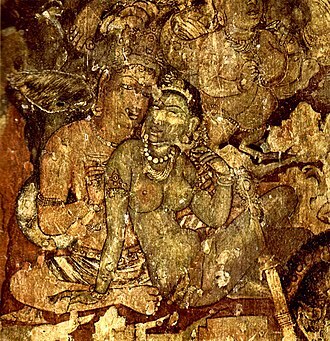 Early accounts of the Deluge equate Matsya with the Vedic deity Prajapati, the Shatapatha Brahmana is the earliest extant text to mention Matsya and the flood myth in Hinduism. It identifies the fish with Prajapati-Brahma, the central characters are the fish and Vaivasvata Manu or Satyavrata who becomes the progenitor of mankind. Gautama Buddha is viewed as an avatar of the god Vishnu in Vaishnava Hinduism. The Buddha is described in important Hindu scriptures, including almost all the major puranas and they portray him with two roles, preaching non-theistic Vedic views in order to restore the Dharma and criticizing animal sacrifice. Another important scripture that mentions him as an avatar is Parasharas Brihat Parashara Hora Shastra, Buddha is often described as a yogi or yogācārya and as a sannyāsi. His father is usually called Śuddhodhana, which is consistent with the Buddhist tradition and he is described as beautiful, of yellow skin, and wearing brown-red or red robes. Only a few mention the worship of Buddha, e. g. the Varahapurana states that one desirous of beauty should worship him. The foolish Jina, imagined him to be his son, thus the lord Sri Hari expertly deluded Jina and other demons by his strong words of non-violence. In many puranas, the Buddha is described as an incarnation of Vishnu who incarnated in order to bring either demons or mankind close to the Vedic dharma. The Bhavishya Purana contains the following, At this time, reminded of the Kali Age, the god Vishnu became born as Gautama, the Shakyamuni, Shuddodana ruled for twenty years, and Shakyasimha for twenty. At the first stage of the Kali Age, the path of the Vedas was destroyed and those who sought refuge with Vishnu were deluded. This pattern changed in the eighth century, the Buddha was replaced as the supreme, imperial deity by one of the Hindu gods. Previously the Buddha had been accorded imperial-style worship and this was the same period of time the Buddha was made into an avatar of Vishnu. Some sources say that it was Sugata Buddha, called Adi-Buddha, O Lord Hari, who have assumed the form of Buddha. O Buddha of compassionate heart, you decry the slaughtering of poor animals performed according to the rules of Vedic sacrifice, radhakrishnan, If a Hindu chants the Vedas on the banks of the Ganges. If the Japanese worship the image of Buddha, if the European is convinced of Christs mediatorship and it is their deepest apprehension of God and Gods fullest revelation to them. The Garuda is a large legendary bird, bird-like creature, or humanoid bird that appears in both Hindu and Buddhist mythology. Garuda is the mount of the Lord Vishnu, Garuda is the Hindu name for the constellation Aquila. The brahminy kite and phoenix are considered to be the contemporary representations of Garuda, Indonesia adopts a more stylistic approach to the Garudas depiction as its national symbol, where it depicts a Javanese eagle. In Hinduism, Garuda is a Hindu divinity, usually the mount of the Lord Vishnu, Garuda is depicted as having the golden body of a strong man with a white face, red wings, and an eagles beak and with a crown on his head. This ancient deity was said to be massive, large enough to block out the sun, Garuda is known as the eternal sworn enemy of the Nāga serpent race and known for feeding exclusively on snakes, such behavior may have referred to the actual short-toed eagle of India. The image of Garuda is often used as the charm or amulet to protect the bearer from attack and its poison, since the king of birds is an implacable enemy. Garudi Vidya is the mantra against snake poison to remove all kinds of evil and his stature in Hindu religion can be gauged by the fact that a dependent Upanishad, the Garudopanishad, and a Purana, the Garuda Purana, is devoted to him. Various names have been attributed to Garuda - Chirada, Kamayusha, Khageshvara, Sitanana, Suparna, Vainateya and others. The Vedas provide the earliest reference of Garuda, though by the name of Śyena, the Puranas, which came into existence much later, mention Garuda as doing the same thing, which indicates that Śyena and Garuda are the same. One of the faces of Śrī Pañcamukha Hanuman is Mahavira Garuda and this face points towards the west. Worship of Garuda is believed to remove the effects of poisons from ones body, in Tamil Vaishnavism Garuda and Hanuman are known as Periya Thiruvadi and Siriya Thiruvadi respectively. Garuda wears the serpent Adisesha on his left wrist and the serpent Gulika on his right wrist, the serpent Vasuki forms his sacred thread. The cobra Takshaka forms his belt on his hip, the snake Karkotaka is worn as his necklace. Ayyappan known as Dharmashaastha, Maṇikantan and Shaastha, is a Hindu deity who is the son of Mohini, an incarnation of Vishnu, and Shiva. He is generally depicted in a yogic posture wearing a bell around his neck, the most prominent Ayyappan shrine is the one at Sabarimala - the abode of Lord Ayyappa - in the hills of Pathanamthitta in Kerala. The shrine receives over ten million pilgrims every year making it one of the largest pilgrimage sites in the world, the pilgrims visiting Sabarimala fast and engage in austerities under the leadership of a Periya Swami. The austerity period starts on the first of the month of Malayalam calender. During this period men are clad in distinctive ritual dhotis of black and dark blue colors, the devotees address Lord Ayyappa as Sri Ayyappan respectfully. The mantra of Lord Ayyappa is Swamiye Saranam Ayyappa which translates to Lord Ayyappa, in ancient, the term Ayyan or Aiyan is a title of respect and the term Appan - which means father - refers to senior members of the community as a mark of respect. Thus Ayyan and Appan put together - Ayyappan - refers to a senior respectable guardian deity of the community. Further evidences in favour of this include the similarities in the unique seating style, with one/two legs folded and raised from the seat. Ayyappan is known as Hariharasutan - son of Hari and Haran in literal translation - because he is the son of Vishnu, called Hari, and Haran, another name of Lord Shiva. He is called Manikantan because when the king Rajasekara Pandiyan of Pandalam found little Ayyappan abandoned in a forest there was a Mani tied around his kantam - meaning neck in Malayalam. A demoness called Mahishi undertook severe penance to avenge the death of her brother and she pleased the creator God Brahma and asked for the boon of invulnerability to all men which He declined. She pondered for a while and asked cleverly for the boon of invulnerability to all men but a son of Shiva, as both Shiva and Vishnu were male Gods there was no possibility of such an offspring and therefore this privilege would make her virtually indestructible. Radha Krishna are collectively known within Hinduism as the combination of both the feminine as well as the masculine aspects of God. With Krishna, Radha is acknowledged as the Supreme Goddess, for it is said that she controls Krishna and it is believed that Krishna enchants the world, but Radha enchants even Him. Therefore She is the goddess of all. It is believed that Radha is not just one cowherd maiden, vigneshwaran cannot be broken into two – Krishna, the eighth incarnation of Vishnu, and his shakti Radha such was the love of Radha towards Krishna that they became one. Krishna in Vrindavana is depicted with Radha standing on his left, the common derivation of shakti and shaktiman, i. e. Female and male principle in a god implies that shakti and shaktiman are the same. Each and every god has its partner, betterhalf or Shakti and it is a not uncommon feature of Hinduism when worship of a pair rather than one personality constitutes worship of God, such is worship of Radha Krishna. Traditions worshiping Krishna, as svayam bhagavan, who is male, include reference and veneration to his Radha and its an accepted view that union of Radha and Krishna may indicate the union of Shakti with the Shaktiman, and this view exists well outside of orthodox Vaishnavism or Krishnaism. The Radha Krishna Ashta Shakthi Mandir at the Parashakthi Temple in Pontiac, from the Vaishnava point of view the divine feminine energy implies a divine source of energy, God or shaktiman. Sita relates to Rama, Lakshmi belongs to Narayana, Radha has Her Krishna, as Krishna is believed to be the source of all manifestations of God, Shri Radha, His consort, is the original source of all shaktis or feminine manifestation of divine energy. A number of interpretations according to traditions possess a common root of personalism in the understanding of worship, jiva Goswami in his Priti Sandarbha states that each of the Gopis exhibits a different level of intensity of passion, among which Radhas is the greatest. The central pivot point of the theology is related to the word rasa and this statement expresses the view that God is the one who enjoys the ultimate rasa or spiritual rapture, emotions. He practiced this religion for nearly twenty years and pilgrims used to arrive in large numbers and cultural contact with Assam was maintained. Hayagriva, spelt Hayagreeva, is a horse-headed avatar of the Lord Vishnu in Hinduism. In Sanskrit, Hayagrīva means haya=Horse, grīva=Neck, in Hinduism, Lord Hayagriva is an avatar of shri Vishnu. He is worshipped as the God of knowledge and wisdom, with a human body, the story represents the triumph of pure knowledge, guided by the hand of God, over the demonic forces of passion and darkness. Origins about the worship of Hayagriva have been researched, some of the early evidences dates back to 2,000 BCE, Hayagriva is one of the prominent deity in Vaishnava tradition. His blessings are sought when beginning study of sacred and secular subjects. Special worship is conducted on the day of the moon in August and on Mahanavami. He is hailed as Hayasirsa and it is very popular among devotees of Hayagrīva. His beauty, like fresh cut crystal, is an auspicious brilliance that never decays, may this Lord of speech who showers such cooling rays of grace on me be forever manifest in my heart. In the Mahavairocana-sutra translated and copied in 1796 by I-hsing it says and his body is the color of the sun at dawn. He wears flaming effulgence and skulls as a garland and his nails are long and sharp, his face shows a pair of bare tiger’s fangs. His hair is that of a burning lion’s mane. He is awesomely powerful and this is the fierce Vidyaraja of the Lotus section. He is just like a horse-jewel of a Cakravartin that wanders the four continents and never does he rest, having all the great and this is his nature, and therefore he possesses this terrible and all-mighty light. Many others submit to him at first sight. This is because though he is fierce and terrible, his heart is full of compassion. ”-- Hayagrīva Stotram, v.32 Later on Hayagriva is referred to as the “Horse necked one”, Defender of faith”, the “Terrible executioner”, the “Excellent Horse”, and the “Aerial horse”. This said, the Horse Avatar of Lord Vishnu is seen as pulling the sun up to the every day. This relationship is the classic nonduality of the Hindu tantra, marichi represents the essence of the power of creation of the cosmos, and is the in/yin half of Dainichi Nyôrai. In Hinduism, Kurma is the second Avatar of Vishnu, succeeding Matsya and preceding Varaha. Like Matsya, this occurred in Satya Yuga. The temples dedicated to Kurma are located in Kurmai, Chittoor district, Andhra Pradesh, scripture indicates that the sage Durvasa had given a garland to Indra, the king of Gods. Indra placed the garland around his elephant, but the animal trampled it, Durvasa cursed the gods to lose their immortality and divine powers. After losing the kingdom of heaven, they approached Vishnu for help and he advised that they had to drink the nectar of immortality to regain their glory. To obtain it, they needed to churn the ocean of milk, a body of water so large they needed Mount Mandara as the staff. The Devas were not strong enough to churn on their own, and declared peace with their foes, Mount Mandara churned, but the force was so great the mountain began to sink into the ocean of milk. 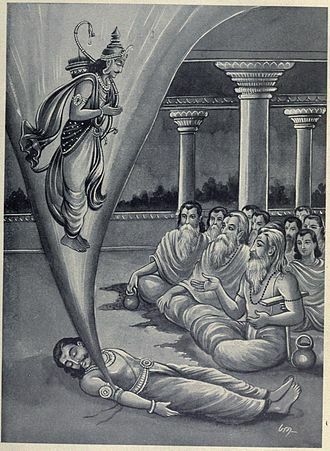 Taking the form of the turtle Kurma, Vishnu bore the mountain on his back as they churned the waters, fourteen precious things arose from the turbulent ocean, culminating with Dhanvantari, the physician of the gods, who brought with him the nectar of immortality. The word Puranas literally means ancient, and it is a vast genre of Indian literature about a wide range of topics, particularly myths and other traditional lore. Composed primarily in Sanskrit, but in languages, several of these texts are named after major Hindu deities such as Vishnu, Shiva. 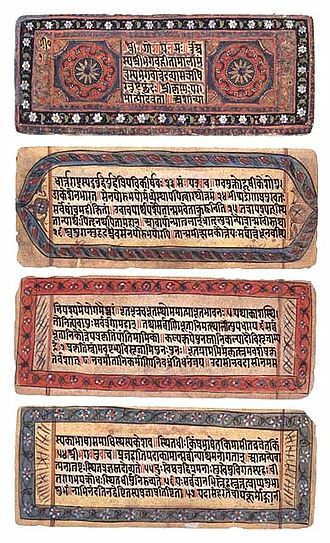 The Puranas genre of literature is found in both Hinduism and Jainism, the content is highly inconsistent across the Puranas, and each Purana has survived in numerous manuscripts which are themselves inconsistent. The Hindu Puranas are anonymous texts and likely the work of authors over the centuries, in contrast, most Jaina Puranas can be dated. 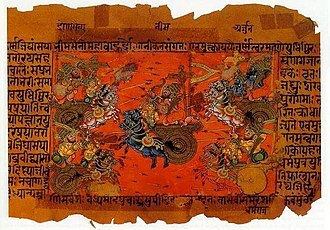 There are 18 Maha Puranas and 18 Upa Puranas, with over 400,000 verses, the first versions of the various Puranas were likely composed between the 3rd- and 10th-century CE. The Puranas do not enjoy the authority of a scripture in Hinduism and they have been influential in the Hindu culture, inspiring major national and regional annual festivals of Hinduism. The religious practices included in them are considered Vaidika, because they do not preach initiation into Tantra, the Bhagavata Purana has been among the most celebrated and popular text in the Puranic genre, and is of non-dualistic tenor. The Puranic literature wove with the Bhakti movement in India, the narrator of the Mahabharata, is hagiographically credited as the compiler of the Puranas. The date of the production of the written texts does not define the date of origin of the Puranas and they existed in an oral form before being written down, and were incrementally modified well into the 16th century. An early occurrence of the term purana is found in the Chandogya Upanishad, translated by Patrick Olivelle as the corpus of histories, the most famous form of itihāsapurāṇaṃ is the Mahabharata. The term appears in the Atharvaveda 11.7.24, the extant Puranas, states Coburn, are not identical to the original Puranas. In the 19th century, F. E. Pargiter believed the original Purana may date to the time of the redaction of the Vedas. Wendy Doniger, based on her study of indologists, assigns approximate dates to the various Puranas and she dates Markandeya Purana to c.250 CE, Matsya Purana to c. 250–500 CE, Vayu Purana to c.350 CE, Harivamsa and Vishnu Purana to c.450 CE, 350–950 CE, Vamana Purana to c.
Religious texts are texts which religious traditions consider to be central to their religious practice or set of beliefs. It is not possible to create an exhaustive list of religious texts, one of the oldest known religious texts is the Kesh Temple Hymn of Ancient Sumer, a set of inscribed clay tablets which scholars typically date around 2600 BCE. 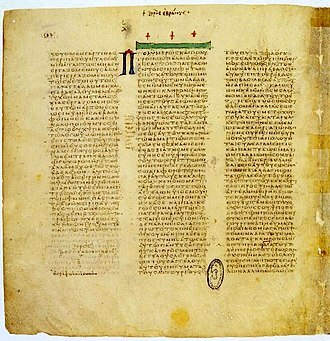 For example, the content of a Protestant Bible may differ from the content of a Catholic Bible, the word canon comes from the Sumerian word meaning standard. Hierographology is the study of sacred texts, the following is an in-exhaustive list of links to specific religious texts which may be used for further, more in-depth study. The writings of Franklin Albert Jones a. k. a, some denominations include the Apocrypha. For Protestantism, this is the 66-book canon - the Jewish Tanakh of 24 books divided differently, some denominations include the 15 books of the Apocrypha between the Old Testament and the New Testament, for a total of 81 books. For Catholicism, this includes seven deuterocanonical books in the Old Testament for a total of 73 books, called the Canon of Trent. For the Eastern Orthodox Church, this includes the anagignoskomena, which consist of the Catholic deuterocanon, plus 3 Maccabees, Psalm 151, the Prayer of Manasseh,4 Maccabees is considered to be canonical by the Georgian Orthodox Church. Some Syriac churches accept the Letter of Baruch as scripture, christian Scientists The Bible Science and Health with Key to the Scriptures by Mary Baker Eddy. This textbook, along with the Bible, serves as the permanent impersonal pastor of the church, the Community of Christ uses the Joseph Smith Translation, which it calls the Inspired Version, as well as updated modern translations. Seventh-day Adventists The Bible The writings of Ellen White are held to a status, though not equal with the Bible. Also known as the Gospel of Mani and The Living Gospel the Treasure of Life the Pragmateia the Book of Mysteries The Book of Giants the Epistles the Psalms, the Shabuhragan The Arzhang The Kephalaia, found in Coptic translation. Odù Ifá Jaap Verduijns Odu Ifa Collection Primary religious texts, that is, the Avesta collection, The Yasna, the Visperad, a collection of supplements to the Yasna. Kurma avatar at Saptashrungi of Shaktism. Some Hindus regard Buddha (bottom centre) as one of the 10 avatars of Vishnu. Krishna, Arjuna at Kurukshetra. Krishna gives the discourse of the Bhagavad Gita. 18-19th century painting. Freer Sackler Gallery. 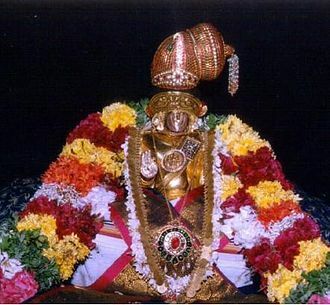 Ayyappan is typically a celibate god. In some locations he is same as Aiyyanar shown above with wives Poorna and Pushkala. German 19th century philosopher Arthur Schopenhauer, impressed by the Upanishads, called the texts "the production of the highest human wisdom". 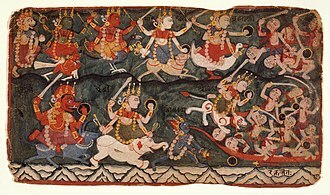 The Goddess Durga Leading the Eight Matrikas in Battle Against the Demon Raktabija, Folio from Devi Mahatmyam, Markandeya Purana. The Puranas include cosmos creation myths such as the Samudra Manthan (churning of the ocean). It is represented in the Angkor Wat temple complex of Cambodia, and at Bangkok airport, Thailand (above). 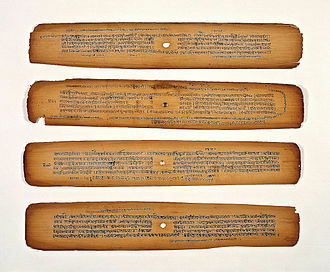 An 11th-century Nepalese palm-leaf manuscript in Sanskrit of Devimahatmya (Markandeya Purana). Prithu appears from Vena's corpse. 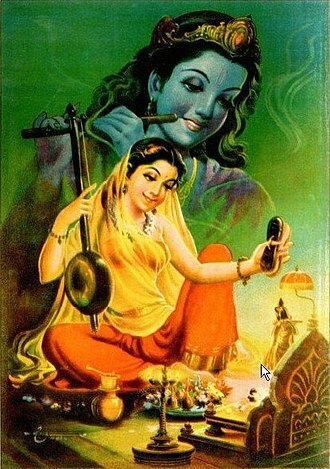 Radha and Krishna pastime on a swing, while Krishna plays his flute. Bronze, probably 20th century. Mirabai and other 15th- to 17th-century Bhakti movement poets drew their inspiration, in part, from the legends and ideas in Bhagavata Purana. A relief showing Krishna with flute, at the 16th-century temple in Hampi, Karnataka. This is an iconic representation of Krishna in the Bhagavata and other Puranas.